For remote teleworkers and inter-office links, DrayTek Vigor routers provide multiple simultaneous VPN tunnels (IPSec/PPTP/L2TP protocols) for secure data exchange and communication. With a dedicated VPN co-processor, the hardware encryption of AES/DES/3DES and hardware key hash of SHA-1/MD5 are seamlessly handled, maintaining maximum router performance. The LAN-to-LAN and remote dial-in capabilities are ideal for remote office linking or teleworker connections to access branch or head-office resources to execute their work as effectively from a remote location as they do from inside the office. SSL VPN with X.509 certificate-based authentication is also available for teleworker applications. Without the necessity of installing a VPN client on individual PCs, the Secure Socket Layer (SSL) virtual private network (VPN) facility lets remote workers connect to the office network at any time. SSL is supported by most standard web browsers. It's convenient for users of small offices and teleworkers who need to access internal applications, file servers and file sharing. With the DrayTek VPN Backup feature you can maintain a permanent connection between two sites. 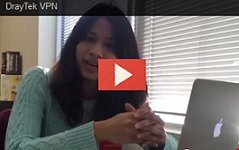 Once a VPN connection drops, an automatic backup VPN connection will be created. 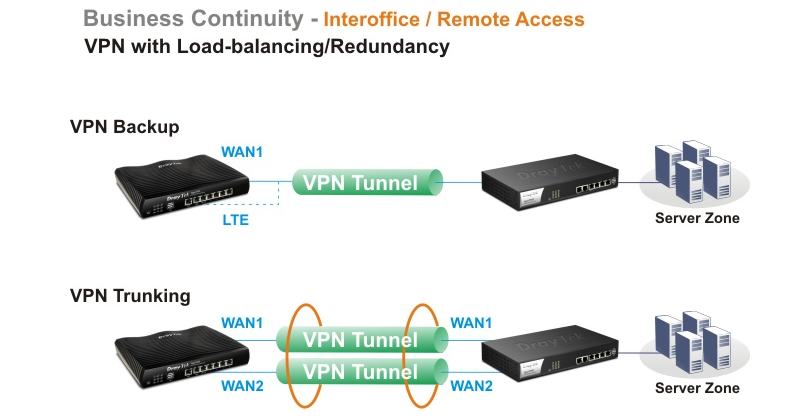 With VPN Load-Balance, you can have two VPN tunnels between sites combined into one VPN Trunk for greater capacity. The two individual VPN connections can utilize separate ISPs for redundancy. DrayTek Vigor routers with their comprehensive VPN functions escalate productivity in a secure and convenient manner.